The concept of the covers album is a risky one. Nothing wrong with slapping one on as a B-side or extra track. But to propose a whole album of covers often begs the question, “What? 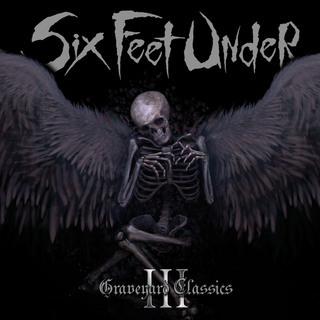 Have they run out of their own material already?” When you decide to make the cover album an ongoing series, you run the risk of self-parody; Six Feet Under are getting dangerously close to that point with Graveyard Classics III. As a caveat, I can tell you I’ve never been a huge fan of 6FU (other than Warpath, which is rad), but I’m always at least a little curious to hear Chris Barnes’ Cookie-Monstered takes on some of the old chestnuts. Inappropriate as the choice of some covers has been in the past (The Monkees? Hendrix? The entire Back In Black album?! ), there’s always a certain level of tongue-in-cheek that goes along with listening to these discs. Luckily, this time around, the sound is there. The guitars are well-produced and give the disc that extra lockjaw crunch that’s needed. But a lot of the covers just really, really don’t fit, and that unfortunately supercedes a lot of my ability to enjoy this disc. Case in point: Kicking off proceedings is Mercyful Fate’s “A Dangerous Meeting”. The very notion of Cookie-Monster Barnes attempting to pull off a King Diamond vocal is laughable, and the end result is pretty much what you’d expect. Musically, it’s a faithful and hefty rendition. But Barnes may as well be gurgling ‘Happy Birthday’ over the track for all it matters. I mean, come on, the Fate cover was meant as a joke, right? Is this some kind of 4:20, Cheech & Chong humour that non-dope-smokers just won’t get? They follow up the Fate cover with Canada’s other national anthem, “Metal on Metal” by Anvil. Timely, as everybody got caught up in ‘Anvil fever’ last year as well, and at first, it’s fun hearing 6FU’s take on it But for me, the novelty of hearing Barnes’ stilted burble over familiar tracks wanes real quick, and with a lot of these tracks, I found myself wanting to go back and listen to the original songs instead. A few times, though, it works: 6FU manages to pull off Metallica’s “Frayed Ends Of Sanity” faithfully, the guitars finally taking precedence over Barnes’ vo-kills. Exciter’s ”Pounding Metal”, and Twisted Sister’s “Destroyer” come off pretty good too, they’re the kind of monolithic songs well-suited to Barnes’ sink-drain-bark-and-quack. Steve Swanson’s guitar work on Prong’s “Snap Your Fingers, Snap Your Neck” stands out as well. But that’s about it. The rest of the covers don’t really bring anything to the table except annoyance or the inevitable what-were-they-thinking facepalm. Yes, BTO’s”Not Fragile” has been long overdue for the metal treatment (previous versions by Tesla and Acid King notwithstanding) just maybe not by Barnes. All in all, about half of the tracks are good, the rest feel like filler. Good god, what will they do for the inevitable GCIV? 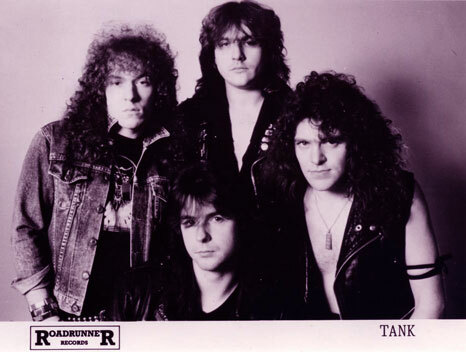 Of all the original NWOBHM bands, few have been as sadly under-valued as London’s Tank. Formed by former Damned/Saints bassist Algy Ward in early 1980, Tank took the raw aggression of Algy’s former punk bands and applied it to a more metal setting.